The back cover of Batman: Earth One proclaims “YOU ONLY THINK YOU KNOW HIS STORY.” Surely, this is simple advertising hyperbole?! The origin of Batman is one of the most well-known superhero stories in the world. Indeed, it may be the most well-known superhero origin story ever. Certainly it is one of the most retold superhero tales, having been explored in graphic novels by Len Wein (The Untold Legend of Batman) and Frank Miller (Batman: Year One) as well as in films by Tim Burton and Christopher Nolan. Riddle me this — who could possibly put a unique spin on the Batman mythos at this point? Why, none other than Geoff Johns, the same writer who revitalized the Justice Society of America for a new generation of comic readers and rebuilt the Green Lantern mythology from the ground up. The story Johns tells in Batman: Earth One is unique, not because of The Batman himself, but because of the personalities around him. By way of a for instance, let us consider the character of Alfred Pennyworth – Bruce Wayne’s loyal butler and chief cohort in the fight against crime. Some Bat-fans my age may vaguely remember that, in an episode of Batman: The Animated Series, Alfred was suggested to be a former spy. The truly dedicated may remember his origin from the comics, depicting Alfred as an aspiring actor who agreed to become a butler due to a deathbed request. Johns borrows a bit from both of these ideas, creating something that is paradoxically original. The usually paternal Alfred Pennyworth is gone, replaced by a soldier who has little inclination or aptitude for raising a child. Johns’ Alfred is a former Royal Marine, security expert, and old army buddy of Thomas Wayne, who is surprised to find himself called to duty, first as head of security for his old friend’s mayoral campaign and then as a guardian for Bruce in the event of Thomas Wayne’s death. Alfred is far from alone in being presented as a completely different person. Jim Gordon, Harvey Bullock, and Oswald Cobblepot are also among the many characters long-time Bat-fans may expect to see and be utterly surprised by. Barbara Gordon is also a part of this tale, but, Batgirl fans will be pleased to note, she is far from being a background character and there are hints of the hellraiser she is to become. The art by Gary Frank is excellent, but his Batman design deserves special attention. This is the first Batman story in any comic in recent memory where I can recall Batman’s eyes being visible underneath his mask, rather than being whited-out or obscured by some type of lens. This may seem like a small detail but it makes all the difference – nearly as much as Johns’ script, which depicts Bruce Wayne as a competent fighter, but one utterly unequipped for precisely what this crusade will require. We get to see every bit of annoyance as his equipment fails, every bit of righteous anger as he confronts an evil doer, and even the brief moments of terror when he realizes he may be in over his head. This helps to do one thing that too few Batman artists or authors bother to do: humanize the hero. 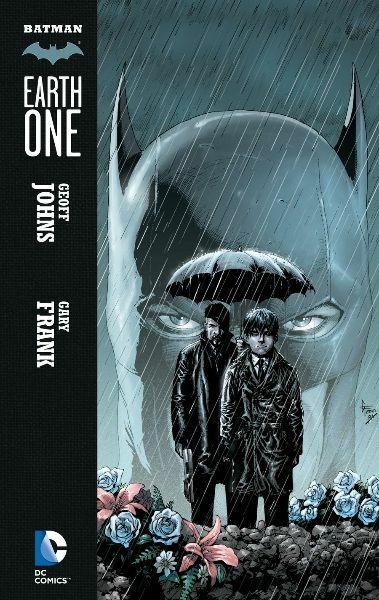 Batman: Earth One is a must-read for all Bat-fans and a must-own for all libraries. There is some graphic content involving a serial killer who preys on young girls, but the artwork suggests far more than it actually shows. There is nothing in this book that would be inappropriate for the teenage audience it is written for.